Shivapuri Nagarjun National Park is located about 12 km away on the northern fringe of Kathmandu Valley. 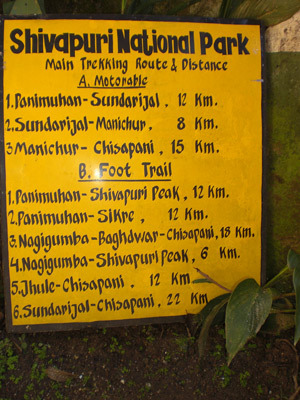 It was designated as the country’s ninth National park in 2002, and covers an area of about 144 km² prior to being a national park; it was managed by the Shivapuri Watershed Development Board, and was later declared as Shivapuri Watershed and Wildlife Reserve. Shivapuri (SNNP) lies in a transition zone between subtropical and temperate climates. The vegetation consists of a variety of natural forest types including pine, oak, rhododendron and more, depending on altitude and aspect. Recorded wildlife in the park includes mammalian species such as Himalayan black bear, leopard, jungle cats, and Rhesus monkey. The park is also home to 177 species of birds - species such as Kalij Pheasant, Common hill partridge, booted eagle, black eagle, sunbirds and more; this includes at least 9 threatened species; 102 species of butterflies, with a number of rare and endangered species; and 129 different species of mushrooms. Rivers, ponds, marshlands, and reservoirs are the major wetlands in this park. Preliminary surveys show that about 0.24km² (0.17%) is covered wetlands. The major wetlands contribute to the recharge of fresh water to the Bagmati, Sunkoshi, and Trisuli rivers. • An entry fee of NRs 250/- (Foreigners) and NRs 10/- (Nepalese) has to be paid at the Park entrance gate. • As respect to religious and cultural sites any removal of cultural artefacts is prohibited. • No one should walk within the park between sunset and sunrise. • Flora and fauna are fully protected and must not be disturbed. • Carry out non-biodegradable items such as plastic bags and bottles. • The use of firewood is strictly prohibited. • Rubbish must be packed out, buried or disposed of in designated areas. • Do not purchase animal or plant products, it is illegal.